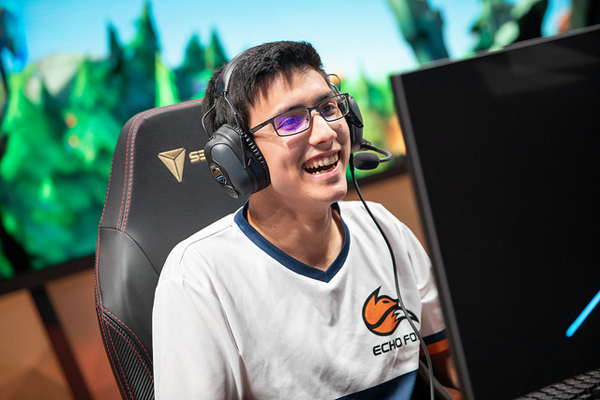 Echo Fox’s bot laner Apollo “Apollo” Price may not show up on a lot of people’s “Top ADCs” lists but with each and every split, Apollo is steadily in the top half of the standing. With Echo Fox finishing a respectable fifth during the 2019 LCS Spring Split, our Amanda Stevens was able to get a quick word in with Apollo about why he thinks he and Hakuho are always the dark horses in bot lane. You and Hakuho have been a bot lane duo for a while now and it’s always brought up on broadcast and interviews that you guys are the “constant” of the bot lane. You’re not always considered the top three of the bot lane but you’re never thought of as bottom-tier either. What is it about you and Hakuho together as a duo that makes you two the “gold standard” point of synergy? Like I said, we’ve been playing for a while so it’s just a matter of constantly trying to improve and better our teamplay and making sure that whatever we’re doing, we’re doing it right. We’re just constantly learning and improving. It helps that we’ve been playing a long time so we know what we’re gonna do. It’s mainly the fact that we have coaches that work with us and that we’re mainly trying to improve ourselves. Do you think this year specifically might be the time to shine and break into that third, maybe second place slot as a bot lane duo as opposed to that “better than the worst, not as good as the best”? I still think we’re top three performance-wise. I think you can argue we’re top three at least performance wise. Sure maybe we’ve had our bad games but we’ve been performing well at least this split. Breaking top one is obviously the challenge but yeah, we’ve been performing really well. For people who don’t know about you and Hakuho; Do you guys hang out a lot? It’s not like Top/Jungle synergy where someone is in your lane all the time. You guys have to have really good communication. Do you guys do anything like as far as hanging out to improve that synergy or is it like you practice, you duo queue together and then it’s “Alright, I’ll see you later man”? First off, we lived with each other on Envy and on Clutch so we’re basically living with each other. We’re actually roommates right now. I don’t think it’s SUPER important. We’re humans, we can talk to each other regardless of us laning with each other. I think it’s because we get along personality-wise and we’ve been playing a long time together. I think if we had issues we still wouldn’t be playing together. It’s just that every time the fans are “Oh these guys are best buddies” and then the second they split you hear all this background drama that was actually going on. Since you guys haven’t split yet maybe people think everything isn’t sunshine and lollipops. We obviously have our weaknesses and issues but we’re working past it. We definitely don’t hate each other. Kinda hard to do that! So we work well with each other. Speaking of weaknesses: What do you think is your most pronounced weakness as a player? I think sometimes it’s hard to be confident, not only in my individual play but in leading my team or saying what I want. I think that’s usually what I have trouble with on-stage. Being confident and playmaking or engaging. Stuff like that. GINX Esports TV will be in attendance at the Spring Split finals in mid-April – although Apollo won’t be, following Echo Fox’s 3-1 loss to TSM in the quarterfinals.